We were only in Mumbai for a couple of nights before heading eastward to Aurangabad. 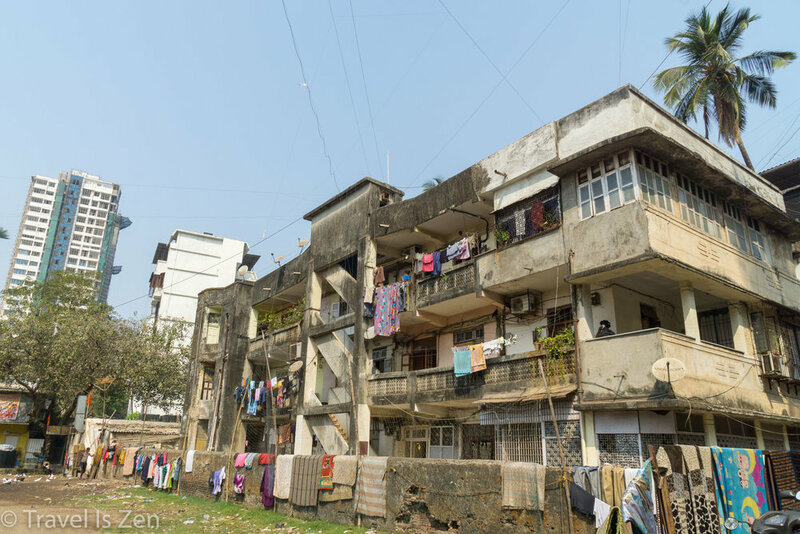 We were staying at the "Horn Ok Please" hostel in the Bandra area of Mumbai, which offered a free walking tour of the neighborhood. Our guide, Alex took us around the sites. One of the most prominent landmarks and legends in Bandra is the story of the Lady of Navigators statue, which currently stands at a promontory overlooking the sea. 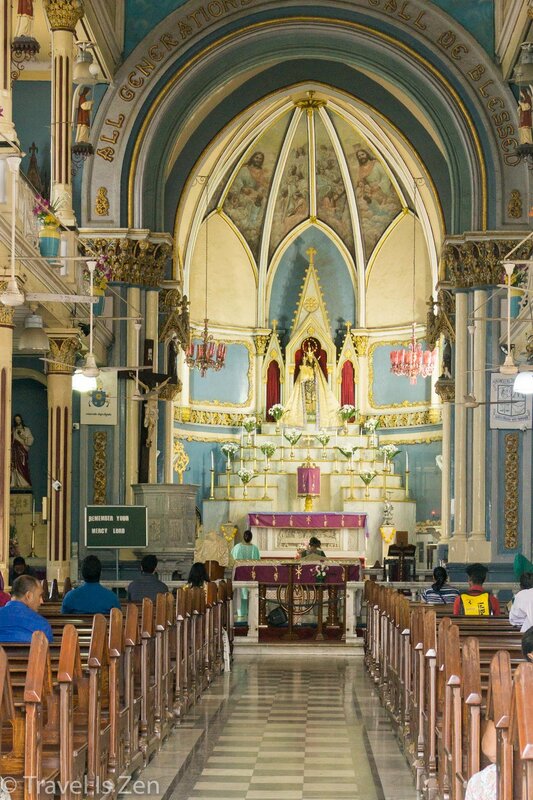 In the 1500's, Jesuit priests brought a statue of St. Mary to their colonial outpost in Bandra and built Mount St. Mary Catholic church on a small hilltop. In the 1700's, Muslim invaders disfigured the statue and it was removed for repair. The original statue of Mary was temporarily replaced by the Lady of Navigators statue in 1760, which was deemed a miraculous find at the time. A local fisherman had dreamt he would find a statue floating in the sea and, by the good grace of God, he did find the Lady of Navigators statue floating in the sea...just in time to replace the disfigured original. The story about the Lady of Navigators statue spread. When the original Mary with baby Jesus statue was repaired a year later, in 1761, Lady of Navigators was moved to a shrine across the street. The shrine attracted an annual pilgrimage of devotees that still continues today. In September, after the Feast of the Nativity Mary, hundreds of thousands of people from all religions gather on Mount St. Mary to pray, request favors, and offer gifts to the Blessed Mary. The festival lasts for a week. Alex said the streets are so packed with pilgrims, vendors, and on-lookers, that residents of the area do not even try to come out of their homes during the festival. Many residents take a vacation elsewhere to avoid the noise and commotion of the 300 year old festival (sounds like some party-pooper Franklin Apple Festers I know!). Mount St. Mary Church was built for the Portuguese soldiers stationed at Castella de Aguada, a fort built on the tip of Bandra peninsula overlooking Mahim Bay in 1640. Portuguese power in the region declined in the early 1700's. When they were defeated by the Marathas in 1739, the fort was destroyed by the British controlling nearby islands to prevent the Marathas from acquiring it. (Who are the Marathas? Download my short e-book for a brief overview of Indian history). The fort was used again prior to World War II, when battalions of Italian and British soldiers were stationed there. Today, Bandra Fort has become a beautiful waterfront park with tropical flowers and intertwined couples making out in the shade. "Chaat" was a new word for me. I'd never heard of it until Alex took us to his favorite snack spot, Punjab Sweet House. Chaat is a general word for a broad range of sweet and savory snacks that can be enjoyed anytime - for a light lunch, an appetizer before dinner, or an evening dessert. I explain more about chaat in this post. We were chaat neophytes, so Alex asked the shop owner to give us a sampling of various kinds. From the second I popped the first pani puri chaat into my mouth, I was hooked. Never before had my tongue experienced such an onrush of flavors and sensations. We had chaat at many places throughout our time in India and I have to agree with Alex that Punjab Sweet House is the best. Our other favorite place for chaat, also in Bandra, is Karachi Sweets. Their dahi puri chaat smothered in yogurt is a perfect lunch on a hot day. 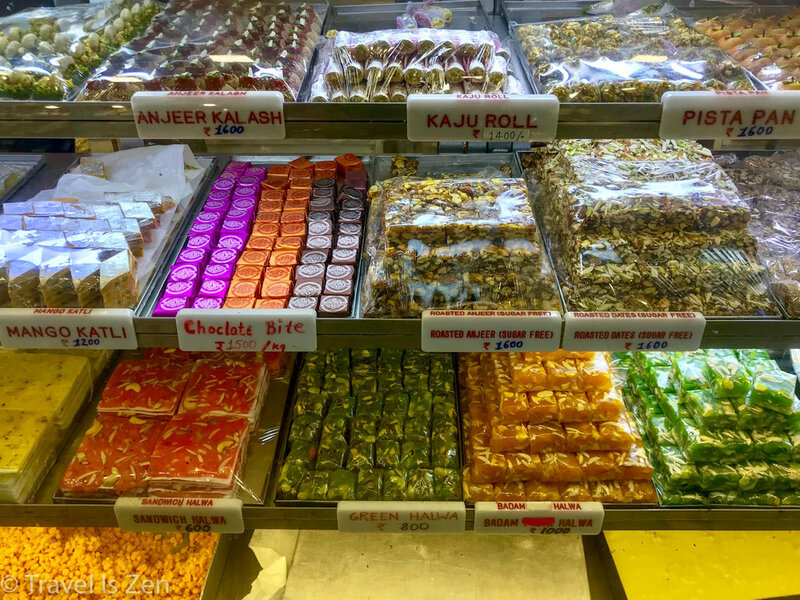 Trivia: Many of the people in India owning sweet shops are of the Halwai caste. When you see a "Halwa" shop, you can expect to find all sorts of delightful confectionaries. The Bandstand Promenade runs along the Indian Sea coastline to Bandra Fort. It's paved, with park benches, sculptures, and landscaping. It's only about a mile long, but it's a nice place for a leg stretch and some sea air. There are plenty of food vendors, too, if you fancy a picnic in Mumbai.